Sentronik USA was established in Florida USA since 1998 and we are specialized in manufacturing all kind of weighing products with the highest quality material for distributors and end-users. The design and engineering team implemented many of the existing commercial load cells in the market and decided to add more capacities and materials in order to give customers more choices. Single point load cell Sentronik 7351 is quick and easy installation, its usually directly. These cells are designed for direct mounting on scales platform small size, using screws or pins directly. 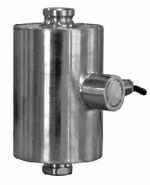 This model Single point load cell Sentronik 7356, is also suitable for handling high capacities and supporting amounts of 30 kg, 60 kg to 150 kg, so as cells are suitable for use as for applications related basculas pendants and platform scales. Its noteworthy that this Single point load cell Sentronik 7356 helps reduce excessive lateral loads, reading errors by mobile link. It has mounting hardware for this product. Our online weighing super-store that has locations all around the world, bringing all our products right to your door step.